Please take note that all grading dates scheduled are tentative subject to availability of hall. National Event will also supersede our club event. 3. 8 December 2019, Sunday. Venue: SMK La Salle, Klang. 3. 15 December 2019, Sunday. To access the location map please go to Event Calendar under the Events & Activities Menu, then go to the date of Grading, click on the event, then click on map to access the location map. The prerequisite to qualify for a grading? A student must be regular in his or her training. He or she must complete at least 10 hours of training before he or she is allowed to sign up for the test. Student with disciplinary problem will be barred from the grading until he or she shows sign of improvement. Grading form and the requisite grading fees must be submitted to the instructor concerned a week before the grading date. Late entry will not be entertained. 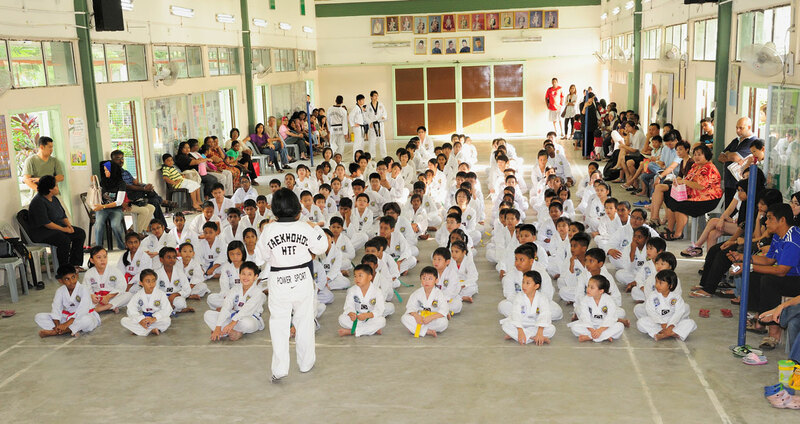 All training fees must also be settled with the instructors before the students are allowed to sit for the grading. What other info should a student be aware of before sitting for the grading? When submitting the grading form, every student must ensure his/her full name together with his/her MyKid no. are filled legibly and correctly. Forms without MyKid no. will be rejected. Note: the MyKid no. is at the top righthand corner of the birth certificate. Student must be appropriately attired (with his/her full dobok and belt). Student not properly attired will be barred from the test. Watches, gold chain, rings or bangles are not allowed to be worn during grading. Only the approved WTF forearm, shin and groin guards are permitted. Long finger nails are not allowed. Students are advised to trim them before grading. Female student with long hair should use a hairband to keep them neat and well-kept. Absentees and late comers will suffer the same fate. They will have their monies forfeited. However, students who are sick and can provide a medical certificate, their grading fees will be refunded to them.